BLACK 10A 125V NEMA 1-15P to IEC 60320 C7 Power Cords. The NEMA 1-15P is a 2 Wire 2 Blade ungrounded plug rated at 125V and 15 Amps in North America. The use of NEMA 1-15R (the receptacle matching the 1-15P) is discontinued in new home installations in the U.S (since 1962). NEMA 1-15P are compatible with the NEMA 5-15R outlet. 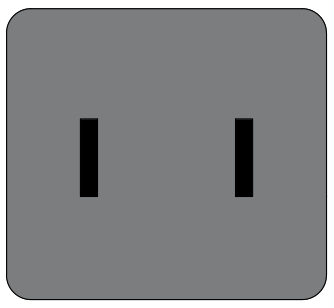 This plug can be "polarized" or "non-polarized", a polarized 1-15P will have unequal blades to prevent harm to devices attached.